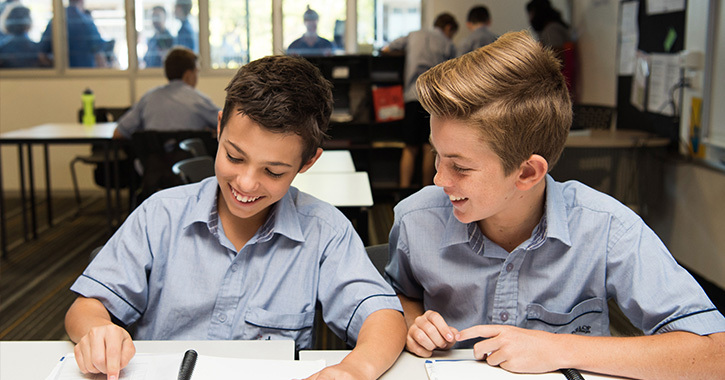 From the very beginning, a strong Charism has prevailed at MacKillop Catholic College. Saint Mary MacKillop’s spirit and way of living the Gospel will give us the courage to trust that nothing is impossible for those who believe in the goodness of God. As we build this College together, we will step out to new horizons; addressing the educational, social, emotional, spiritual and physical needs of our students of this time. Energy and time will be given to walking with those at the edge of society, offering service and bringing hope. As the College grows, service learning programs will be part of our culture. We know that the social and emotional wellbeing of students is supported by valuing their connectedness to community, and that the College’s teaching, learning and ethos are enhanced by its connections and partnerships. We will look for opportunities for authentic participation and contribution for all students – a whole school approach. 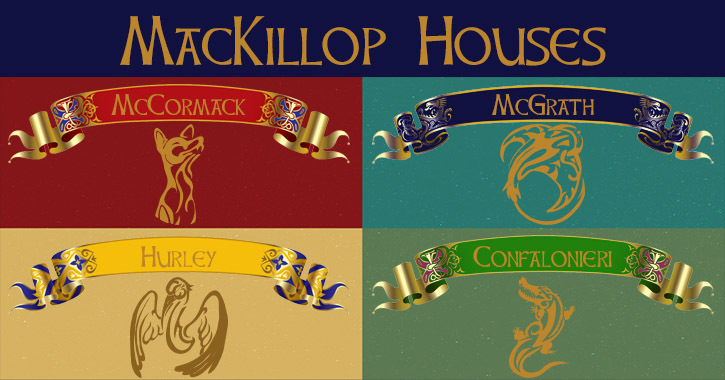 The motto of MacKillop Catholic College is ‘Lead with Courage’. 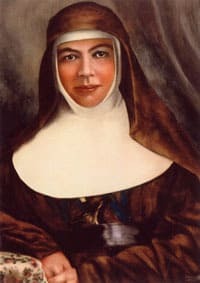 In the spirit of Saint Mary MacKillop, our house patrons, and of the soldiers who defended our country from this site in WWII, we want to be known for “never seeing a need without doing something about it”, to lead, to be on the forefront, and to be able to see what needs to be done and have the courage to take action. The logo represents the undulating land of the site, the same distinguishable and prominent geography, within its relatively flat surroundings, that made our site ideal for the defences of the 16 Mile Camp. A path leading to the cross of St. Mary MacKillop signifies the metaphor of journey – as learners and as people – and coming closer to Christ, which permeates through all we do at MacKillop. The Southern Cross reminds us of Mary MacKillop’s connection to our part of the world, and her dedication to establishing an education system for disadvantaged children in Australia and New Zealand. Mary Helen MacKillop was born on the 15th January 1842 to Scottish immigrant parents in Fitzroy, Melbourne. She grew up as the eldest of eight children. Mary and her siblings had a difficult childhood, living through poverty and uncertainty. Her parents, although good people, struggled to adequately provide for the family. Her father, Alexander, had many failed business dealings, and the responsibility of making an income increasingly fell to the children, particularly Mary. At the age of 14, Mary began providing for her family by working as a clerk at Sands and Kenny Stationers in Melbourne. 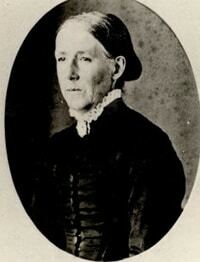 When she was 18, in 1860, she moved to the small town of Penola in South Australia, where she worked as a governess for her aunty and uncle. Part of Mary’s job as governess was to educate her young cousins, a calling she became passionate about. Part of her inspiration came from her father, who despite his financial failings and lack of a formal education himself, had educated his own children and instilled in them a love of learning, possibly his greatest legacy. Other children eventually came to sit in Mary’s lessons, especially those in need from surrounding areas. It was at about this time that she met Father Julian Woods, a priest at the local Catholic Church in Penola. Woods and MacKillop became close friends, sharing a desire to find a way to serve those in need throughout the ever-growing population of regional Australia. They established St. Joseph’s School in a disused stable in Penola. 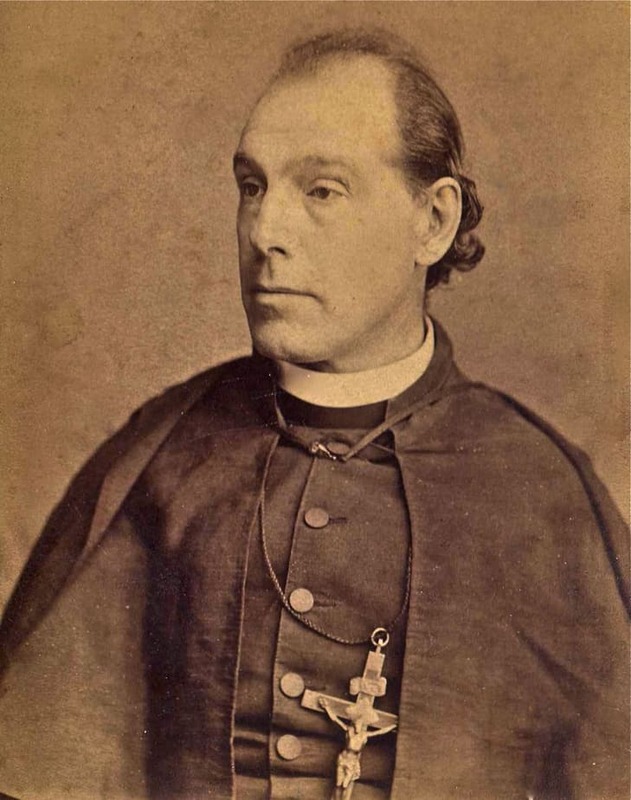 In 1866, Woods was made secretary to the bishop of Adelaide, Dr Sheil. 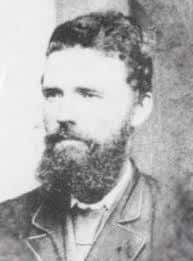 Before leaving Penola, he helped Mary officially establish the order of Saint Joseph, a new religious order of nuns for Australia. In 1867, Mary became the first sister, and Mother Superior, of the new order. By the end of that year, 10 other women joined. 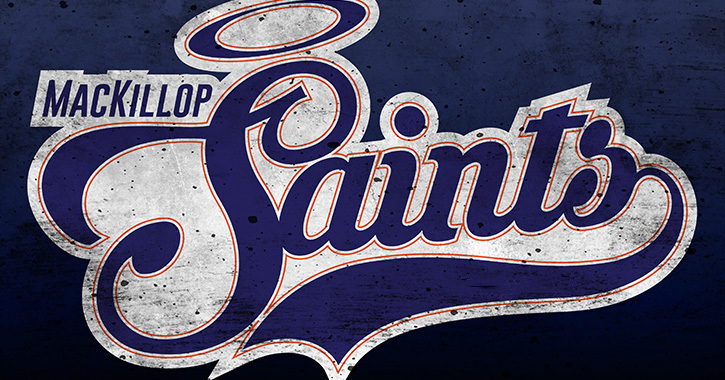 By 1871, over 120 women had become Sisters of St. Joseph. To this day, they continue to serve those in need throughout Australia, fulfilling the dream of their determined founder. Find more information on Mary’s life and work on the official Mary MacKillop website. Another great Mary MacKillop article can be found here. 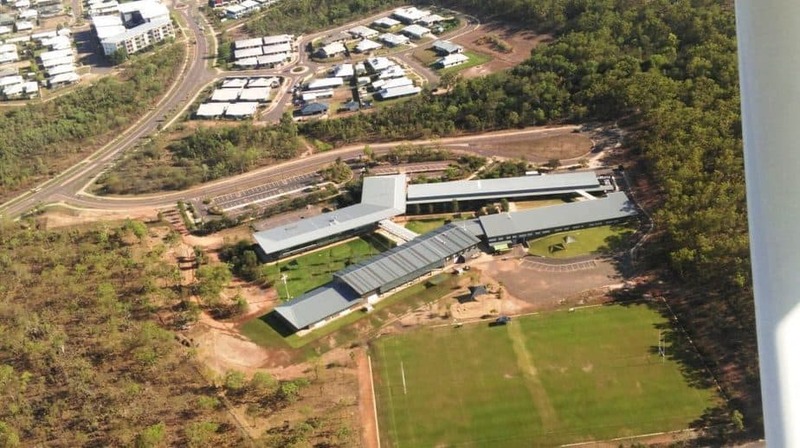 Bordered on three sides by a conservation site, a WW2 heritage site and a sacred site of the Larrakia people, MacKillop Catholic College will always retain its bushland setting. 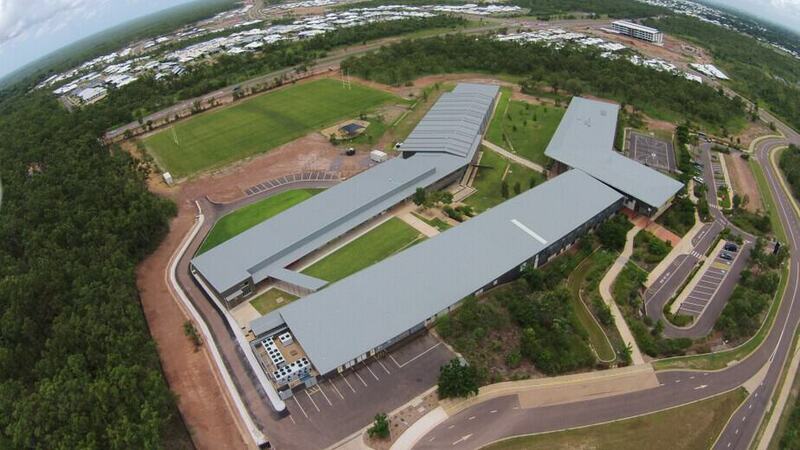 The College is bounded to the east by the 16 Mile Camp – a site of military and cultural significance. 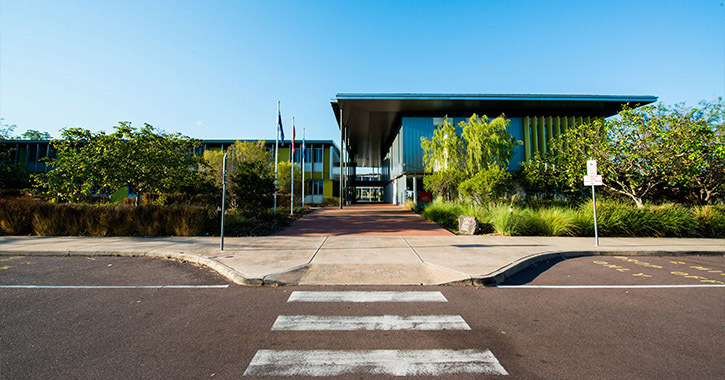 On the western side of the College is situated a site which is of significance to local Aboriginal people. 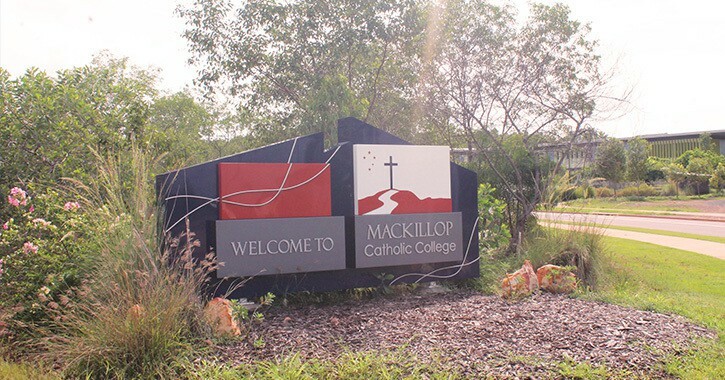 MacKillop Catholic College is bound on its southern side by Lambrick Avenue and the College playing fields, and on the north by Northern Territory conservation land. 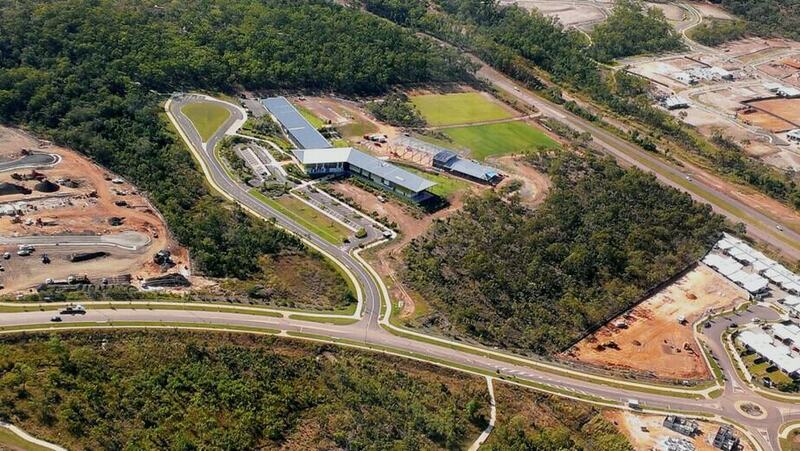 The first construction stage of MacKillop Catholic College was completed in 2012. 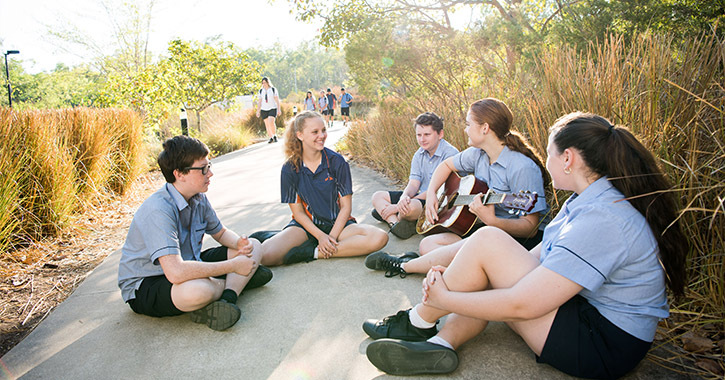 In the years since, MacKillop Catholic College has progressively established itself within its environment; creating historical, cultural, geographic, social, and economic connections. Students appreciate that they are part of a bigger story, and that they are not the first people to visit this place. 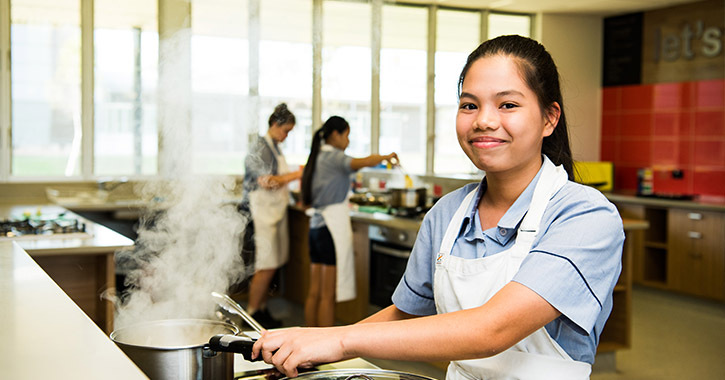 Through connecting with place and people, MacKillop Catholic College students learn the meaning of courage, endurance, teamwork, leadership and respect. There are many lessons that can be drawn from this camp and its history. For example, the College motto ‘Lead with Courage’ echoes the sentiments of the soldiers who occupied the camp during World War II. By studying events connected to the camp, MacKillop students have a deeper understanding of what it takes to overcome adversity, the need to stick together, and the importance of making a stand for what is right, regardless of the consequences. This links beautifully with Mary MacKillop’s famous quote ,“Never see a need without doing something about it” (Mary MacKillop, 1867). We hope that this understanding and appreciation will also lead to students actively working to protect the site for future generations. 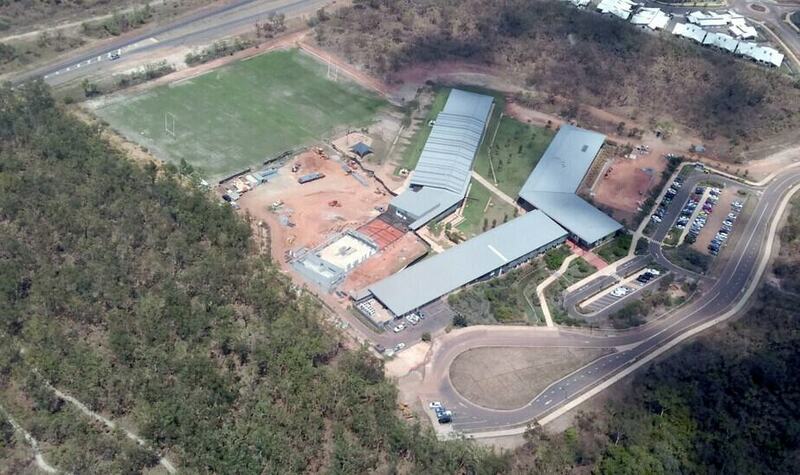 The following information is drawn from the Defence of Darwin Website and the signage around the site itself. 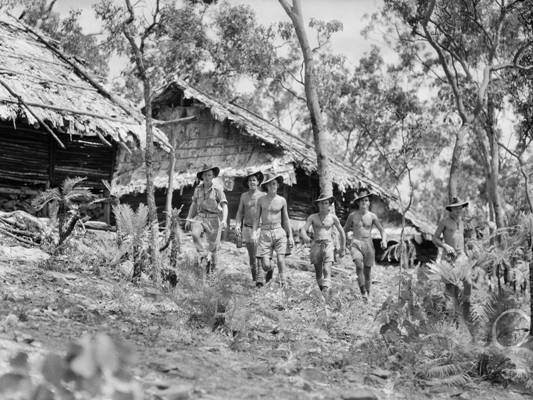 First occupied just prior to the Japanese raids of 19 February 1942, 16 Mile Camp was the first of the ‘mile’ camps along the old North-South Road, now replaced by the Stuart Highway. 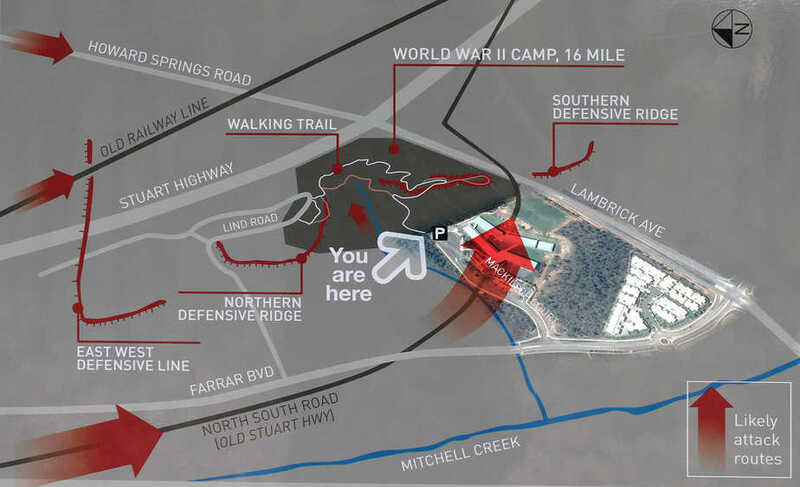 The camp was named for its distance from Darwin — 16 miles — and was developed after the bombings to help defend against an expected Japanese invasion. 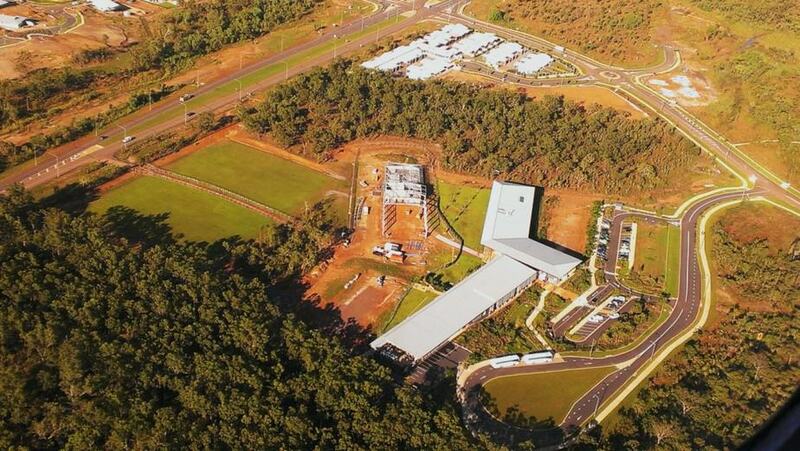 Used as a base for both US and Australian troops, the camp’s remains are testimony to its former role as a key fixture in Australia’s defence. Few images exist of 16 Mile Camp, however a number of images taken at other ‘mile’ camps during World War II provide insight into the lifestyle of those military personnel who lived in this camp during that time. 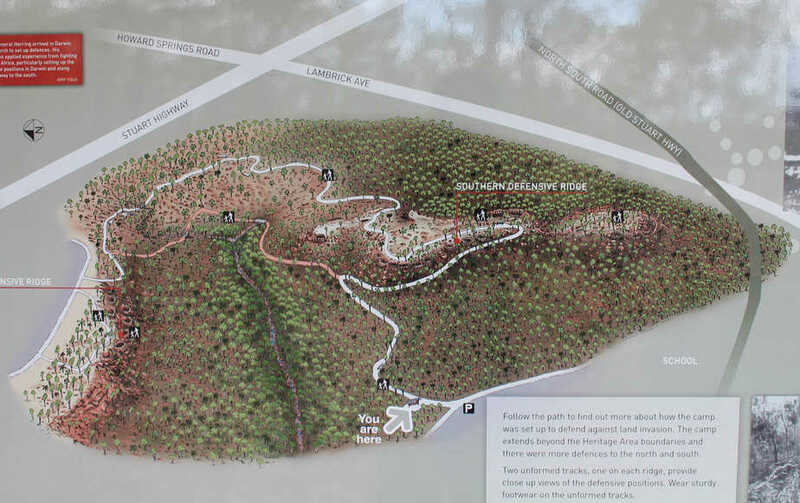 Illustration of the topography of the camp site, from the signage on the walking track. 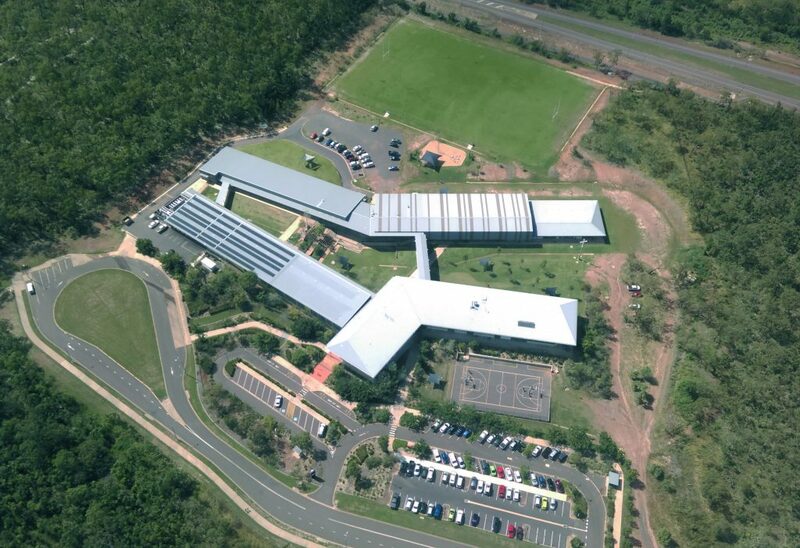 Map of the site with an aerial view of the College superimposed for reference. Larger map of the area, with a map of areas of archeological significance. 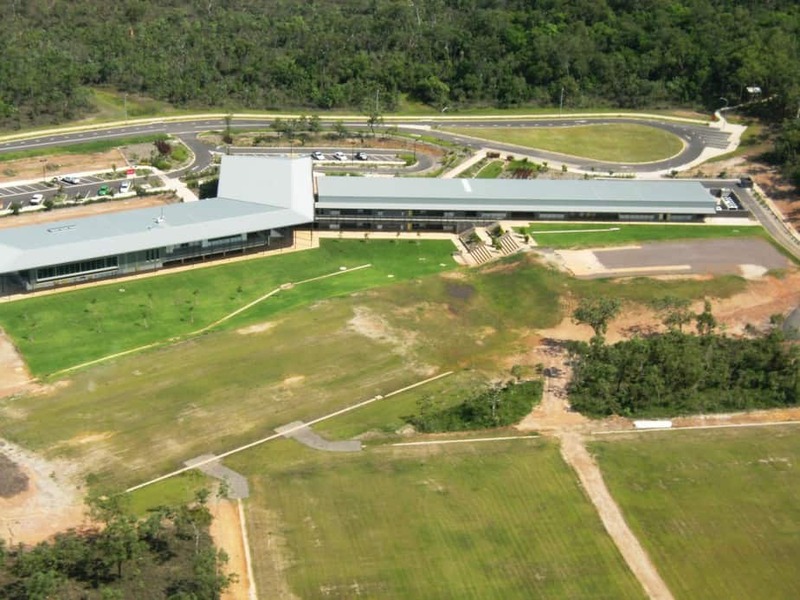 The land on which our College is built, as part of the greater surrounding area from Cox Peninsula in the west to Gunn Point in the north, Adelaide River in the east and south to the Charlotte River, is Larrakia country. 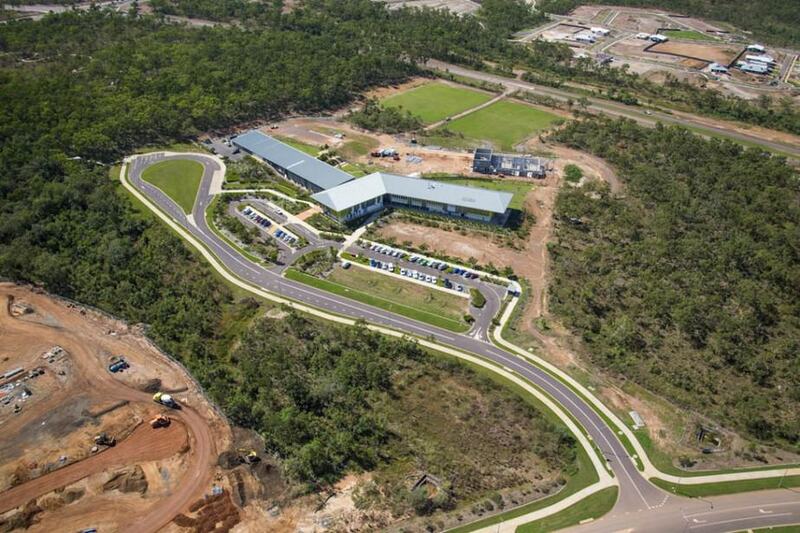 Countless generations of Larrakia or “Saltwater” people have lived on this land for many thousands of years. They had, and continue to successfully maintain, a vibrant society based on a close relationship with the sea and trade with neighbouring groups such as the Tiwi, Wagait and Wulna. These groups shared ceremonies and songlines, and intermarried. Today there are about 2000 people who identify as Larrakia. 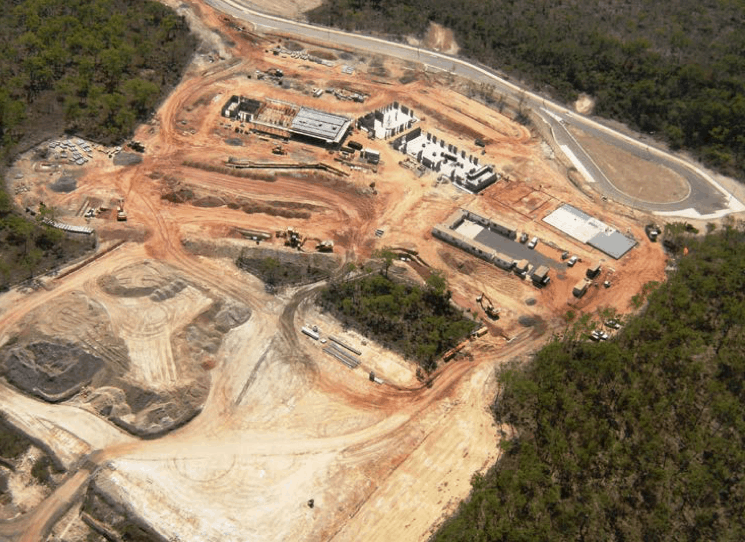 Larrakia are broadly recognised for their strengths in performance, music and art, and as traditional custodians of the Territory’s capital, hold special responsibility in Australia’s cultural landscape. 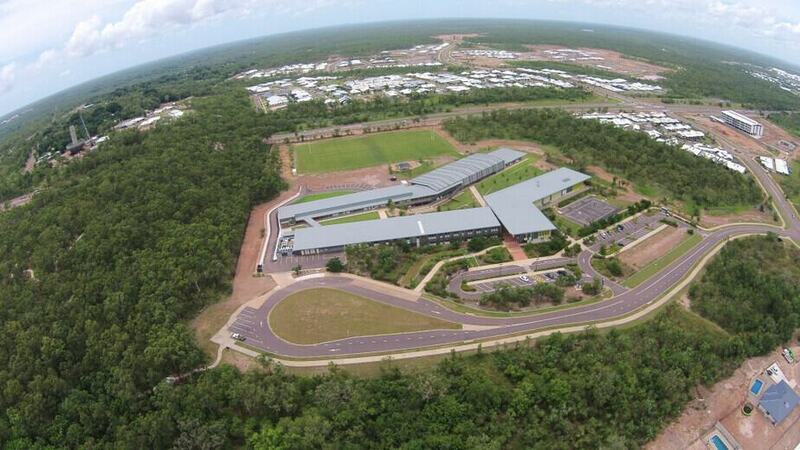 When the first European settlers arrived in the Darwin area, the Larrakia provided them with food. Despite conflict and marginalisation, from the beginning the Larrakia participated in the cultural life of the early settlement, and lived in and around the city, before they were moved out to camps further away from the city. 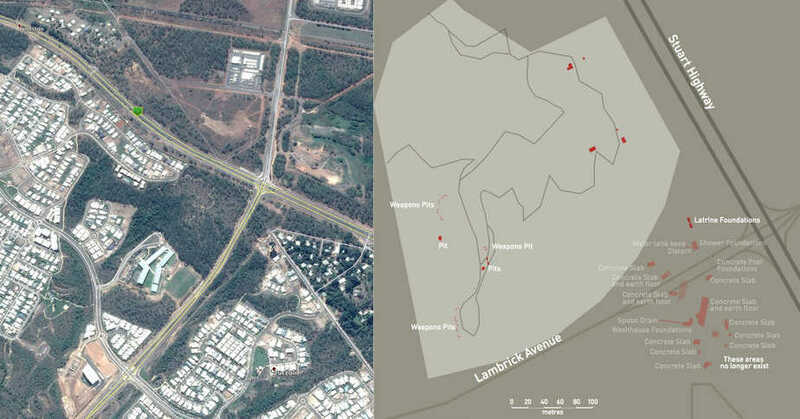 Many popular sites around Darwin also hold specific meaning for Larrakia people. 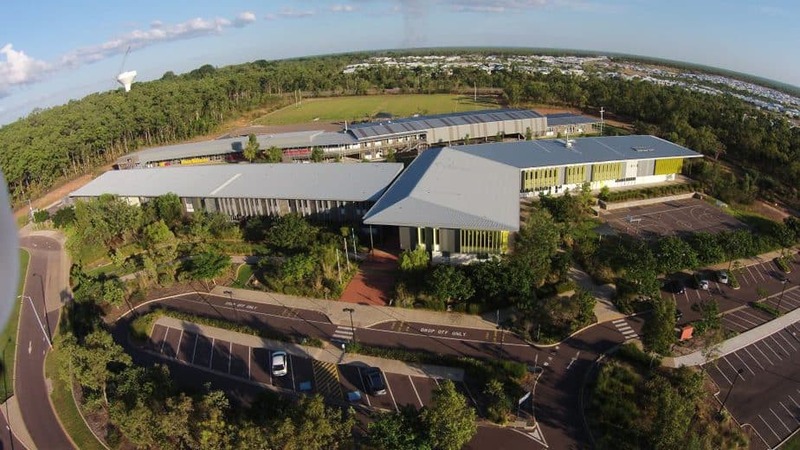 MacKillop Catholic College respectfully acknowledges the Larrakia as the traditional owners of this land, and pays respect to their Elders past, present and future.